Different types of retirement accounts have different contribution limits. People age 50 and over may be allowed to contribute more. Making maximum contributions can make a huge difference over time. After-tax contributions can supplement savings. Saving any amount toward your retirement is good — if you can, consider contributing the maximum allowed amount to your IRA or employer retirement plan. You should also build up short-term savings so that you don't have to tap into retirement savings for emergencies. If you are 50 or over, now may be the time to make catch-up contributions. Saving now can still significantly increase your retirement savings. If you participate in a workplace plan — such as a 401(k) — consider contributing at least enough to qualify for the maximum employer matching contribution. It’s essentially free money, so you don’t want to miss out on it. People age 50 or above can make catch-up contributions to IRAs and most workplace retirement plans. These special contributions are in addition to the regular contribution limits and represent an opportunity to increase your retirement savings. 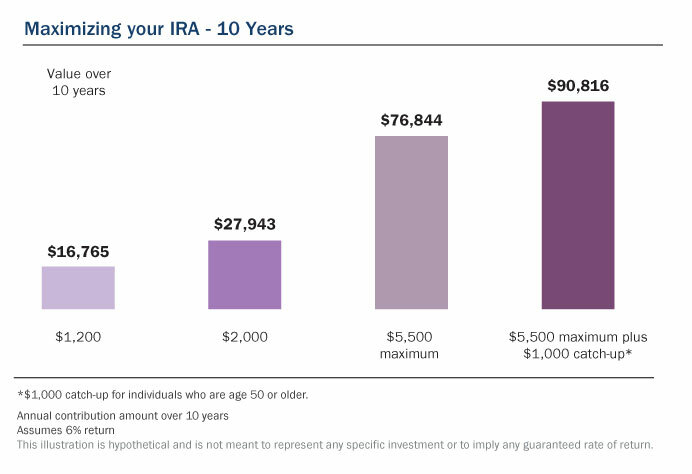 For 2019, the regular IRA contribution limit is $6,000. Eligible individuals can make a $1,000 catch-up contribution, for a total of $7,000. For 2018, the regular 401(k) contribution limit is $19,000. An eligible worker can make a $6,000 catch-up contribution, for a total of $25,000. If you participate in one or more governmental 457(b) plans, you can make a combined $6,000 catch-up contribution to your plans. You do not need to combine this limit with other employer plan types. If you are eligible for the double limit catch-up on a 457 plan, you may not contribute both the double limit and the age 50 catch-up. If you participate in any other combination of employer-sponsored 401(k), 403(b) or SIMPLE IRA/401(k)s, total catch-up contributions can't exceed $6,000. If you are eligible for the 15-year rule catch-up on a 403(b) plan and you are 50 or older, you can make both types of catch-up contributions. Is it worth making maximum contributions? Absolutely. Let’s say that you contribute $1,200 to an IRA every year over a 10-year period. With an annual, compounded return of 6%, your savings would total $16,765. On the other hand, if you contribute $5,500 to an IRA annually, and keep the other factors the same, you would end up with $76,844. The numbers are even more impressive for workplace plans, such as the 401(k) and 403(b), which have higher contribution limits. You can make maximum contributions to both an employer plan such as a 401(k) and an IRA in the same year, assuming you have earned income and you otherwise qualify. But you may not be able to deduct your traditional IRA contribution, depending on your income. If you make a non-deductible traditional IRA contribution, you must report it by filing IRS Form 8606, Non-Deductible IRAs, with your tax return. Consider funding a non-deductible traditional IRA if your income is too high to allow you to make a Roth IRA contribution. Distributions from a Roth IRA are generally tax-free (rather than just tax-deferred) provided certain requirements are met. You may also be eligible to make after- tax contributions to your 401(k) plan, if the plan permits it. After- tax contributions to a 401(k) don’t count against the $18,500 deferral limit ($24,500 if 50 or older) but they do count against the overall limit of $55,000 ($61,000 if 50 or older) for 2018. To the extent that you can afford to save additional after-tax dollars after you have maxed out your tax-advantaged options, you can do so in other types of investments. An Ameriprise financial advisor can help you determine what types of savings or investments are appropriate for your situation. Ask your advisor about ways to maximize your contributions to your retirement accounts. Ask an advisor near you about ways to maximize your contributions to your retirement accounts. Ask an advisor about ways to maximize your contributions to your retirement accounts.